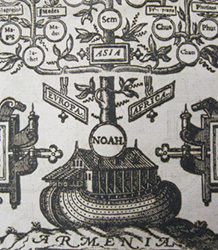 The latest research project in theology to begin here at the University of Exeter focuses on exploring how ethnicity, race, and religion were understood by Jews and Christians at the time of Christian origins. To find out more about the project aims and the contemporary relevance of the research, I spoke to project leader Professor David Horrell who shared his inspiration for the project and revealed what we can expect from the upcoming conference. As the project focuses on the time of Christian origins it primarily explores New Testament texts – especially the letters of Paul and 1 Peter. Other early Christian texts within and beyond the New Testament will also be considered, as well as Jewish texts from the same time period such as the writings of Josephus and Philo. Image: King James Bible from 1634 Credit: Photograph by David Horrell, courtesy of Exeter Cathedral Library. Speakers attending the conference include Professor Musa Dube, (University of Botswana), Dr Ma. Marilou S. Ibita, (Catholic University of Leuven, Belgium, and the Institute of Formation and Religious Studies, Quezon City, the Philippines), and Dr Gregory Cuéllar (Austin Presbyterian Theological Seminary, USA). front of a wider audience. 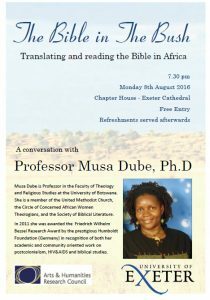 On Monday 8th August a public lecture has been arranged with Professor Musa Dube, who will be speaking on The Bible in the Bush: Translating and reading the Bible in Africa. The event is open to all and begins at 7.30 pm in Chapter House on Exeter Cathedral grounds. It certainly looks to be an eventful few months for the project – we look forward to the conference and to seeing the results of this exciting research as it emerges! ‘Ethnicity, Race, and Religion in Early Christian and Jewish Identities,’ is an AHRC funded project set to run until March 2017. To find out more about the ongoing research, visit the project webpage. 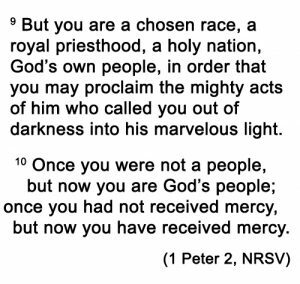 This entry was posted in Conference announcements, Our research and tagged bible, Biblical Studies, Christianity, Ethnicity, Josephus, Judaism, New Testament, Race, Theology, Theology Conference, University of Exeter by aalp1990. Bookmark the permalink.